Where do you keep your raw meats, dairy and produce at home? In an old, dirty, rusted and unrefrigerated container? No, you put them in a properly cooled refrigerator, which is more than what food giant Sysco was doing, claimed a San Francisco news station’s investigation back in July. Now the United States Department of Agriculture is looking into Sysco after it received a complaint from a local meat trade association. 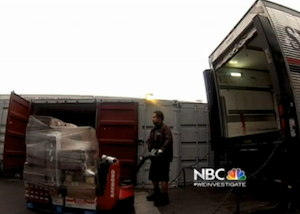 In July, NBC Bay Area reported that Sysco Corporation had rented outdoor storage units and used them for years as makeshift warehouses before food was shipped out to restaurants and other destinations across Northern California. The investigation claimed to have seen meat sitting in unrefrigerated sheds for long periods of time when temperatures outside were at 81 degrees. That report set off a statewide effort by the California Department of Public Health, and now the USDA is getting involved. Canadian health officials have also launched an investigation, one that has uncovered 21 apparently unacceptable sheds so far throughout California that were used by Sysco to store food. The agency isn’t saying specifically why it’s decided to check into things now, only that it received a complaint from staffers at a meat trade association after they saw the NBC report on the food sheds. “We’re very concerned because this Sysco problem violates the trust the growers have in growing the safest food in the world and the producers of meat and poultry in abiding by the federal laws that are the toughest in the world,” Rep. Sam Farr, the ranking member of the Appropriations subcommittee on Agriculture, Rural Development and Food and Drug Administration told NBC Bay Area. Sysco should be setting an example for other food industry companies, so if it’s forced to change, it could prompt others to clean up their acts as well. “I think this is going to require the transportation industry and the handling industry to upgrade those protocols and if they won’t do it themselves then government will do it for them,” Farr said. A spokesman for Sysco says the company doesn’t use any of the sheds it had rented and it’s cooperating with the government’s investigation.